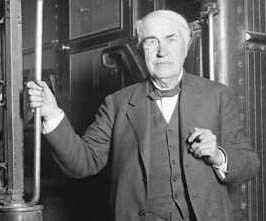 Edison set up his first laboratory in the basement of the family home...at the insistance of his mother. Eventually, he was permitted to move his work into an empty railcar. Edison worked as a roving telegrapher from 1862 until 1868. During 1869, while employed by the Western Union Telegraph Company in New York, he started working on his own inventions. Western Union commissioned him to create an improved stock ticker, and the result was the "Edison Universal Stock Printer." With profits from the sales of tickers and printing telegraphs, he set up a research laboratory at Menlo Park, New Jersey in 1876. In 1877, Edison invented the phonograph. In 1879, he first demonstrated his incandescent light bulb.